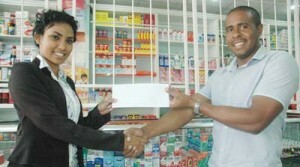 Accountant at The Medicine Chest Pharmacy on Middle Street, Arron Fraser, hands over their contribution to Director at Respect the Game Inc., Surika Danraj yesterday ahead of the Dec. 13 Charity Basketball Event at the Cliff Anderson Sports Hall. Respect the Game Inc., as part of its contribution to Saturday’s Charity Basketball Event, which features the local celebrities and professionals at the Cliff Anderson Sports Hall. Director at Respect the Game Inc., Surika Danraj thanked the pharmacy for their contribution as she highlighted that approximately seven charitable organisations will benefit from the proceeds received from the event, which is first major one for the organisation. The event is a call out to all sportsmen and women to return respect to the game, whatever your game may be; whether its the arts, sports, business or professional sectors, ‘Respect the Game’ is geared toward returning ‘respect’ to society using what it believes to be the one forum that brings people together, which is sports.